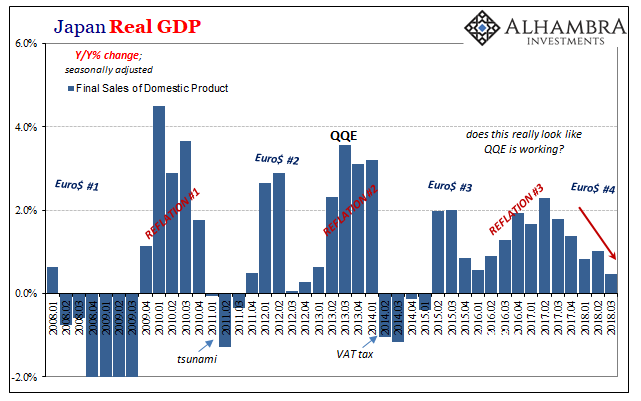 There was more than enough evidence that QE didn’t work fifteen years ago. The Japanese had accumulated these monetary experiments at the dawn of the 21st century. And there was even a time when US and Western central bankers were skeptical. What happened was 2008; a dislocation so big and widespread they had no choice but to embrace the failure for lack of any other options. Once they did, what was most charitably ambiguous suddenly became genius. When the Japanese did these things, they were suspect; when Western central bankers did, they were awesome. Same planet, different worlds. Only, the Japanese central bankers kept doing them, too. It’s much harder to hide in Japan than it has been in the United States or Europe. The decimated economic landscape there leaves little open to interpretation. This is not a positive comparison since Japan is merely our forerunner, a look into our future. To begin with, the central bank is (largely) irrelevant. 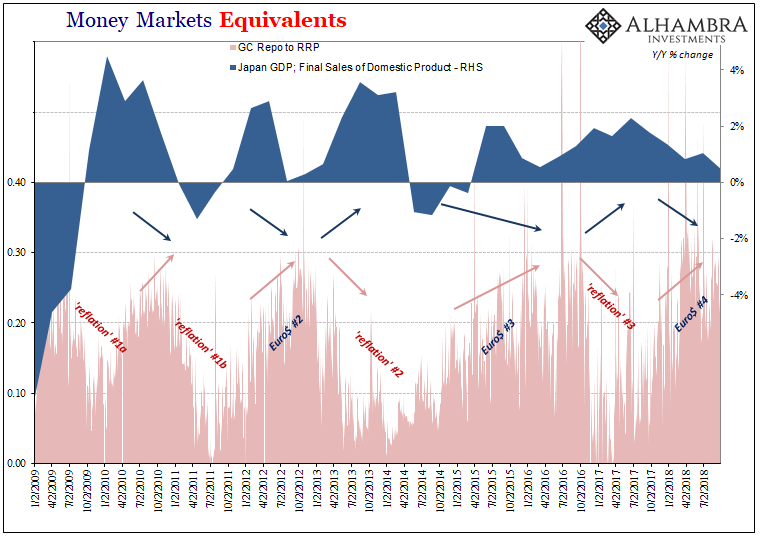 QE or QQE is nothing more than a series of tricks, smoke and mirrors glossed up to sound impressive and a little scientific (portfolio effects!) In reality, the world which we share with the impoverished (literally) Japanese, unfortunately, magic tricks can’t replace true economic processes. That’s why QE never worked to begin the millennium and it doesn’t now no matter how many additional letters and numbers are added to it. The Bank of Japan, like Economists in the West, can’t admit it. They just can’t. To do so would mean to confess decades of incompetence and gross dereliction. It is a binary choice; we keep getting these non-answers until someone forces them to stop. They won’t do it voluntarily. Central banks have proven by their own actions, not their words, that they will only allow “their” recovery which in the end means none. As I have written before, if they were given a choice of maintaining power and control but only leading to more lost decades, or stepping aside and being guaranteed a full and sustainable recovery, they would choose the former every single time. 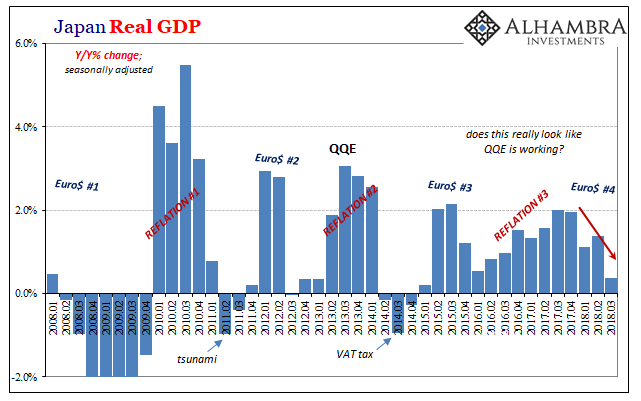 True global economic recovery is purely a political action now; central banks will not restrain themselves no matter how much their schemes backfire and create only more disruption and havoc. Japan’s economy is likely to continue growing at a pace above its potential in fiscal 2018, mainly against the background of highly accommodative financial conditions and the underpinnings through government spending, with overseas economies continuing to grow firmly on the whole. But instead that country’s Cabinet Office today reports that Japan’s economy isn’t growing at all, regardless of potential. The passage quoted above was prepared by the central bank at the end of October, meaning a full month after Q3 had ended. 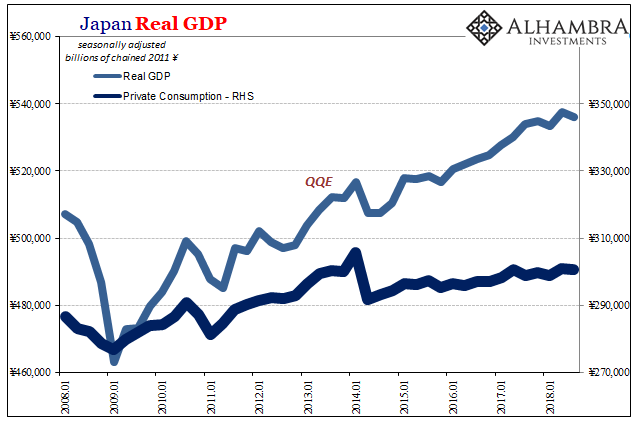 Japanese GDP in Q3? Minus 0.3%. This is the second contracting quarter in the last three, meaning two out of the three so far in 2018. 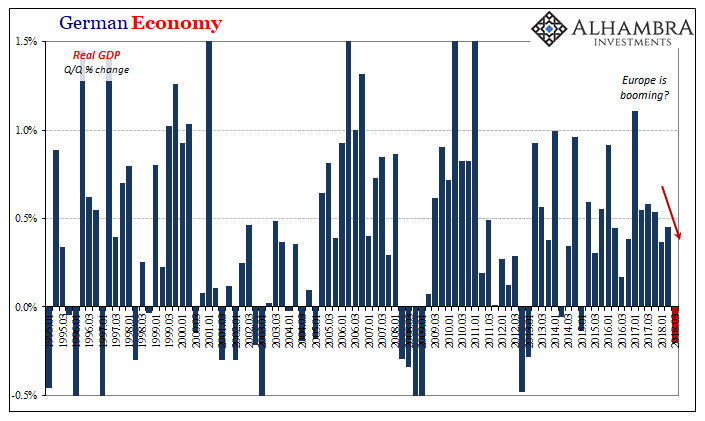 On a year-over-year basis, the economy has ground to a halt. It’s the timing of it that should be our global focus. Japan’s economy peaked in Q3 2017. This had nothing whatsoever to do with monetary policy or even Japan specifically. That was the quarter when the eurodollar system began showing signs of distress. Japan, as Germany, is uniquely susceptible to trade disruptions; which is where turmoil churning within the global reserve currency system hits first. Japan’s external slowdown predates any trade war concerns (by a lot). Growth in Final Sales of Domestic Product, for example, a GDP component that includes export sales, peaked in Q2 2017. It has been nearly flat over the last year, too. QQE has been an utter disaster. Economic growth during its more than half decade run has actually been worse than the overall “recovery” as a whole from the 2009 trough.  The BoJ now practically owns companies and financial markets with what to show for it? GDP growth over the last five plus years since it started has been 0.9% per year compared to 1.5% since Q1 2009. Caught up in the mess are the regular Japanese citizens who are being stuck with the short end of the stick. And it’s not even close. This is because Japan’s economic fate has never been tied to the BoJ one way or another. Every single time the Japanese economy, meaning the global economy, begins to take a step forward (reflation) it doesn’t get very far for very long (eurodollar squeezes). The Japanese people, like Italians, Brazilians, or Americans, can sense these changes at the margins in a way that central bankers just aren’t capable (ideology). 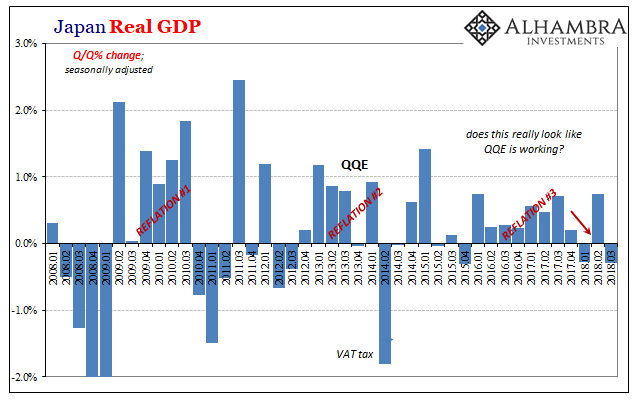 It’s a total disaster not because QQE or the first QE in 2001 was the cause(s), rather by keeping the same ideological blindness in place nothing else is ever tried. There is never an honest search for answers. Central bankers can’t even admit there is a problem, even the obvious one for Japan in 2018. The whole economic system rots for lack of imagination. 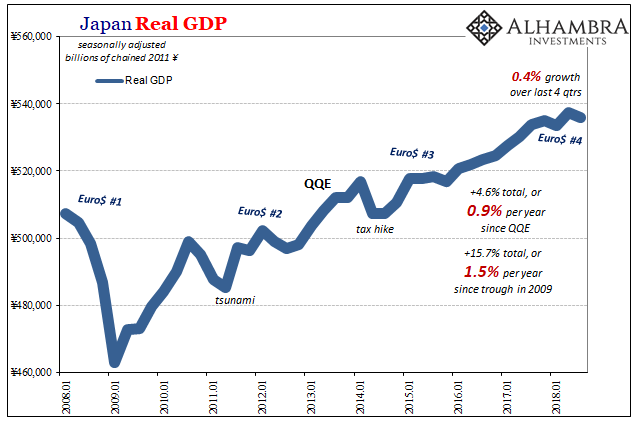 And what Japan’s plight proves most of all is that it can go on and on far longer than you might otherwise think possible (a recovery has to happen at some point, right? NO.) It’s something out of Keynes; the economy can go without legitimate growth far longer than any peoples can remain rational. For good measure, Destatis, Germany’s government bureau responsible for producing that country’s GDP estimates, also reports today a negative number for its last quarter (Q3). It is being dismissed as emissions and climate/weather, but Japan’s concurrent weakness shows otherwise. This is a growing global downturn. This year is proving to be a trainwreck in too many important places. It was supposed to be the arrival of worldwide recovery. Worse, too many arrows are still pointing down for 2019. But you wouldn’t know it from the Bank of Japan, ECB, Federal Reserve, etc. Not until they are forced into some honest assessments for once. What I wrote in 2016 still applies. There is plausible path back to full and complete recovery. It just has nothing to do with QE’s or even Economics, except the total purge of any thoughts about QE’s as well as to transform Economics back into economics (starting with monetary economics). It is purely political. And this is why populism becomes increasingly radical (in both directions, left and right) as all this economic pain goes unanswered each and every time.